Conventional calendars and clocks are designed to expose the quantity of time, expressed in months, days, hours, minutes and seconds. 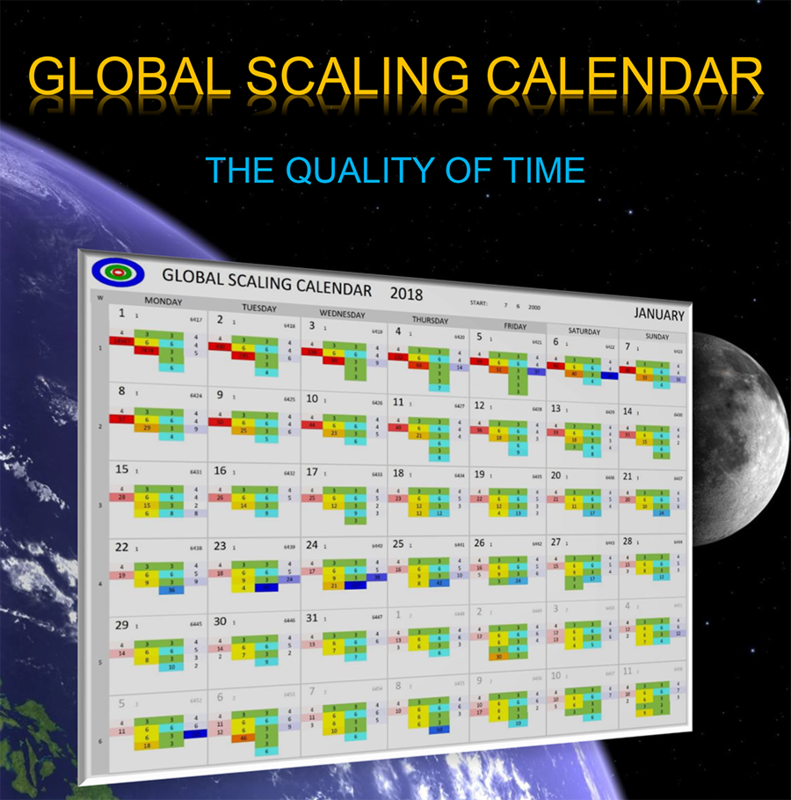 The Global Scaling Calendar indicates the quality of time. What is the quality of time? Like space, time has not only quantitative characteristics, but also qualitative. The quantity of space is its magnitude while the topology is its quality. The quantity of time is its duration while the chronology (sequence of events) is its quality. Though, the chronology is individual for any process, isnâ€™t it? Yes, it is. The quality of time is process-dependent. Nevertheless, some chronological characteristics like the event density are process-independent and can be predicted with high accuracy. Contrary to conventional beliefs, time is not homogeneous. Time is nonlinear and fractal. Fractality means that some patterns repeat themselves in different scales. This property of time is called scale-invariance. Exactly this circumstance makes possible the prediction. What is the origin of those repeating patterns? In all processes we can find the harmonics of two fundamental quantum oscillators. They are known as proton and electron. In fact, proton and electron are the most stable oscillators in the universe. Their stability is superior to everything, reaching thousand billion billions of billions years (1030). For this reason, they determine the course of all processes and the composition of all structures in all scales of the universe. This phenomenon is called Global Scaling. Proton and electron are the Metronomes of the Universe and their harmonics compose the Melody of Creation of all forms of cosmic life. Because of their eternal stability, proton and electron form stable harmonics called atoms, the essential chemical elements which create an infinite abundance of life in the universe. The proton represents 1836 times more energy than the electron. Therefore, the main properties of an atom as chemical element depend on the number of protons. The spectrum of space-time harmonics, formed by proton and electron is of highest importance in the Universe and for this reason, it is called the Fundamental Fractal (FF) of space-time. The fundamental fractal rules the event structure of any process, regardless of its nature and complexity. The knowledge of the fundamental fractal allows to forecast the event density, the fluctuation and trend change probability, the stability and flexibility ranges and many other essential process properties at any time. Global Scaling as scientific paradigm leads to a new understanding of life as cosmic phenomenon and opens a new world of outstanding methods of research and development. The Global Scaling Calendar is an indispensable tool for application in science and engineering and in daily life as well. The Global Scaling Calendar consists of cells that contain daily information about the expected event density, the fluctuation and trend change probability and other essential process properties. These process properties are symbolically represented by numbers and colors. In general, more intense color and larger numbers significate higher expected event density and higher probability of process fluctuation and trend change. Fig. 1: One week of the Global Scaling Calendar with date of process start (green ellipse in the top) and current week number (green ellipse on the left border). Each cell shows 4 projections (columns RE, R, B, BE) of the Fundamental Fractal at 6 temporal scaling layers (rows). Fig.1 shows the first calendar week in January 2018 of a process that started on June 7th in 2000. Fig. 2 shows in detail the calendar cell of Thursday the January 4th, 2018 that is the 6420th day since process start on June 7th, 2000. The cell shows 4 projections of the Fundamental Fractal (columns R and B are internal projections, RE and BE are external projections) at 6 temporal scaling layers (rows of colored cells with numbers inside). Fig. 2: One day of the Global Scaling Calendar with current date (January 4th), number of days (6420) since process start, the temporal scaling layers (1 â€“ 6) for the internal (R, B) and the external (RE, BE) projections of the Fundamental Fractal. The significance level on each temporal scaling layer is shown by color of different saturation that increases with the amount of the indicated numbers. The color saturation and the corresponding number indicate how far (low saturation and small number) or close (high saturation and large number) the process is to an event node of the next higher temporal scaling layer. In general, deeper layers and smaller numbers correspond to less significance. R and B show the daily position in the FF of the process regarding its inner dynamics, while RE and BE show the resonance disposition of the process. Resonance means interaction with external processes. In general, RED event nodes are related to deeper, subtle and sometimes hidden process properties, while BLUE event nodes are related to more direct, concrete and exposed process properties. In the GREEN areas these properties are superimposed. For example, in engineering in the case of material fatigue, RED event nodes of high significance level can correspond to the formation of microscopic cracks, while BLUE event nodes of high significance level can indicate high fracture probability. In the case of healing, for example a wound healing process, high significance BLUE event nodes can correspond to coagulation, epithelialization and maturation, while RED areas can be related to vasodilation, inflammation and angiogenesis. The GREEN areas shall mark the transition intervals between the main stages of the wound healing process. In the case of a human life, RED event nodes correspond mainly to the evolution of consciousness, while BLUE event nodes are mostly related to physical changes. GREEN areas, in general, signify periods of equilibrated soft physical and mental development. The borders of GREEN areas correspond mostly with high complexity and advanced development stages. Working with the Global Scaling Calendar, we invite you to make your own experience. Sign in to our GLOBAL SCALING WEBINARS to share your experience and learn more about the Fundamental Fractal and the Global Scaling Calendar. The information provided on this page is, at best, of a general nature and cannot substitute for the advice of a medical professional (for instance, a qualified doctor/physician, nurse, pharmacist etc.). The Global Scaling Calendar is not a doctor. Please note: This page does not give legal advice or medical advice. Use the Global Scaling Calendar at your own risk.